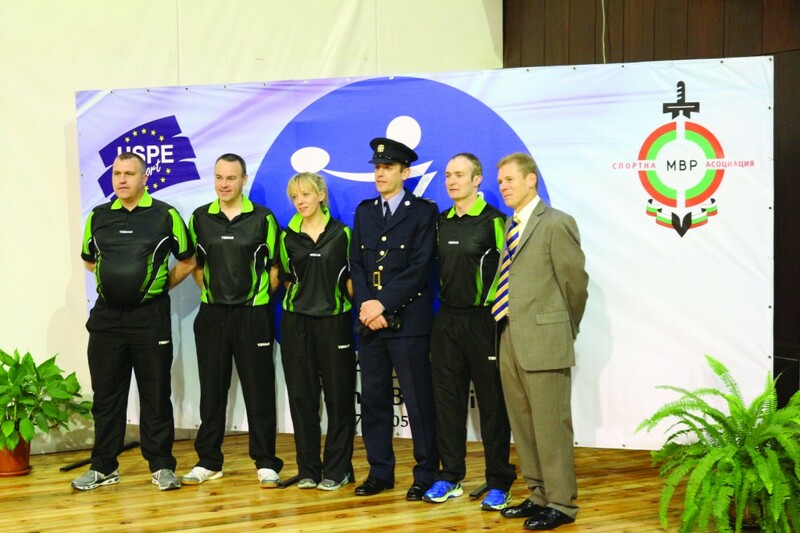 The Garda team consisting of members from five divisions across the country competed in the Union Sportive Des Polices D’Europe Table Tennis championships in Bulgaria recently. The team had trained collectively in Athlone over the winter months with Athlone Table Tennis Club under the guidance of Irish international Karim Sabir. The opening ceremony where each country has one member in their police uniform is a very important part of the European Police Championships. The honour to represent An Garda Síochána fell to Garda Ian Philips of the Donegal Division. The Garda team were drawn against France (pre tournaments favourites) and Norway in the team competition. The team of Garda Stephen Joyce, Sergeant Adrian Flynn and Garda Ian Hutchinson had some great performances against the French and Norwegian teams but lost out on qualification for knock out stages. The women’s singles competition started on the same day and Garda Louise Long had a superb performance to claim victory over the much fancied Krasimira Telbis, from the host nation Bulgaria, winning in straight sets. Next up for Long was French international Caroline Petit. Long stormed into a two set lead with aggressive confident play but her very resilient French opponent refused to be put away. The exertions of her first victory took their toll on Long and in the intense heat of the Varna stadium the French player hung on in which ended with Long narrowly losing in the fifth set. 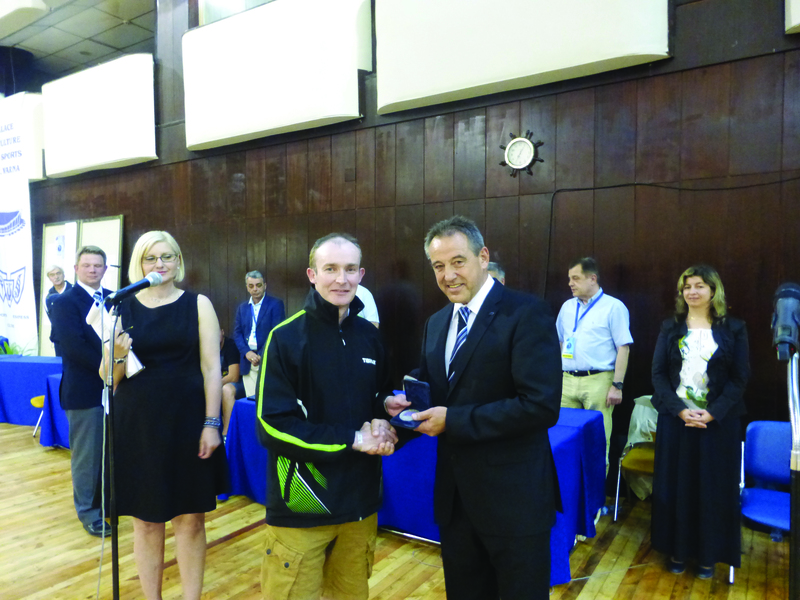 The singles men’s tournament started the next day and again the Irish team acquitted themselves well with all players pushing opponents with some nail biting contests going all the way to duce and Sergant Adrian Flynn taking sets off Nikolaus Petrou, Cyprus and Katalin Donchea, Romania. The mixed doubles team of Garda Louise Long and Garda Stephen English had a very credible performance, losing out to the French team of Reynald Resse/Amandine Chintemi in the quarter final in a very exciting match with the Irish team taking the first set. However the vastly experienced French side eventually won out. Both of the doubles men’s teams of Sergeant Adrian Flynn/Garda Stephen Joyce and Garda Ian Hutchinson /Garda Ian Philips had excellent performances at this level of competition with Flynn and Joyce losing in the quarter final to the Czech Republic team of Martin Matejisek/Milan Borik, having pushed the Czech Republic to duce eventually loosing 12 10 in the first set. Overall the Garda team contested two quarter finals mixed and men’s doubles and ended with a team finishing ranking of ninth. At this level of competition their performances are very encouraging for the sport within Ireland and An Garda Síochána. An Garda Síochána received a further honour when Sergeant Adrian Flynn, at the final awards and closing ceremony, received the inaugural Union Sportive Des Polices D’ Europe Merit/Recognition/Fair play award for his involvement in USPE European Police Championships in table tennis for 20 years. The Garda Table Tennis Club would also like to thank St Raphael’s Garda Credit Union for their contribution to the Garda team.